A very good day to everyone and ourselves!! Today, we continue our journey and passed through some beautiful sights before finally paying the Atomium a visit! 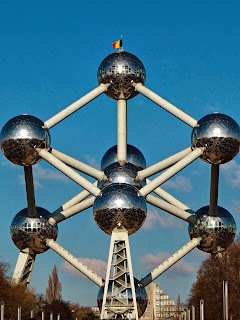 The Atomium, symbol of Brussels and Belgium, is an international tourist attraction. 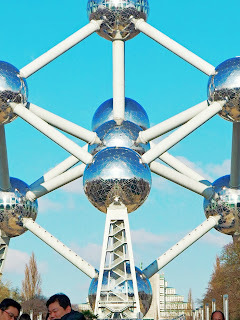 This unique piece of architecture, was created on the occasion of the World Fair of Brussels in 1958, and became one of the most popular monuments in the land of Europe. A seminal totem in the Brussels skyline. Neither tower nor pyramid. Half-way between sculpture and architecture. A relic of the past with a determinedly futuristic look. The Atomium is the only symbol of its kind in the world, which eludes any kind of classification. The idea was centered on an optimistic modernity – intended to make people forget World War II. The Atomium today presents a surrealistic walk through tubes and spheres; the most beautiful panorama – 102 meters above Brussels and its surroundings. Beyond surreal walks through tubes and spheres, a permanent exhibition about the history of the building and temporary exhibitions with different themes. At night, the 9 spheres are lit up with 2970 LED lights that opens a “Fairy dimension” to the 102 meter high structure, creating a very special show. 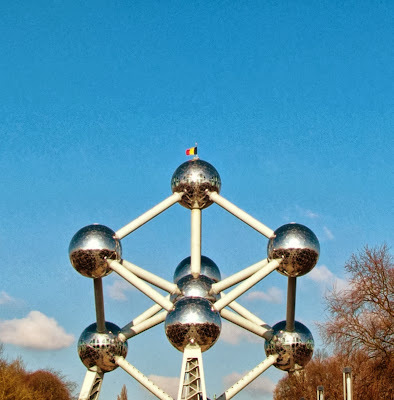 The Atomium is established by 9 spheres. These 9 spheres are connected by 20 tubes with the whole “Atom” resting on 3 pillars. Where will we be heading next?? BTW, I need your help. When you have a bit of time, tell me. Hey Yuki! I’ll be glad to help, what is it you need? Need some information about summer festivals in Japan.